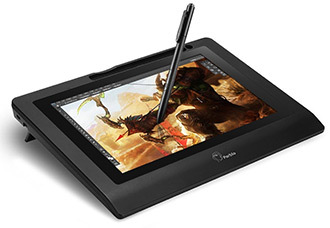 The digital art world is full of drawing tablets of different shapes, sizes, and brands. 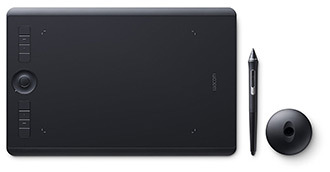 But the best choice for a beginner is the Intuos Pro medium non-display tablet. It comes with a battery-free pen that never needs to be charged. It can connect to the tablet via bluetooth so your marks will always be accurate & crystal clear. And the medium sized drawing area offers plenty of space for a beginner. But this is just my recommendation based on personal experience. If you’re adamant about a different tablet or a cheaper option then this guide will help. 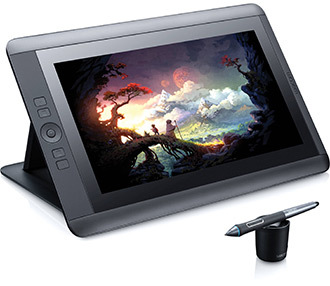 I’ll cover the best drawing tablets for beginners just getting into digital art. There’s always a learning curve moving from traditional to digital so you’ll want to make sure that any drawing tablet you get is something you’ll love. What Makes A Great Tablet? If you’re new to digital tablets then you’ll probably be confused about all the features. But it’s not too hard to understand & the more you research the more you learn. There are two main types of tablets: displays and non-displays. The display tablets show a screen on the device and you draw directly onto the screen. Non-display tablets are more “traditional” drawing tablets where you draw on a black area while staring at your monitor. The strokes are recorded on the tablet and they translate into whatever software you’re using(Photoshop, Krita, PaintTool SAI). Most beginners should start with non-display tablets because they’re cheaper. Granted it is much easier to draw on a display tablet, but there’s always a learning curve so it’s better to start cheap. The obvious place to start is Wacom because their tables are used by industry professionals everywhere. But you can do amazing work on tablets made by other companies like XP-Pen, Huion, Ugee, or Parblo(among others). The goal is to find which features you need in a price range that works for your budget. Do you want a larger tablet(longer than 1ft) or are you okay with a smaller tablet? Do you specifically want a display tablet? Or are you willing to spend a bit more for higher quality? Also remember that smaller tablets are easier to carry around in a laptop bag if you ever want to draw/paint digitally from your laptop. Some smaller tablets can be powered from USB while others require a wall outlet. All of these features are important to consider when going through this list. But if you want a tablet that’ll last you 5-6 years, maybe even a decade, then going with a higher-end brand like Wacom is the best solution. I have no doubt the Wacom Intuos Pro is the best drawing tablet for beginners. It’s surprisingly affordable considering all the features you get with it. Wacom’s tablet hardware is some of the best in the world so you’d be starting with a powerhouse. The Intuos brand is Wacom’s middle-ground tech so it’s not the cheapest, but also not the most expensive. Along the left side of the tablet you’ll find eight express keys, also called hotkeys or quick keys. They are fully programmable so you can change their actions to whatever you want. And the center wheel also works like a radial button which can be programmed to adjust brush settings, document zoom, or other similar features. This tablet has more features than you’ll know what to do with so it can take time to adjust. But it feels great when in use and the design is phenomenal. It only measures about 1ft long and about 9″ high so it should fit on any desk. It’s also super thin measuring about 8mm on the edge. Because the stylus comes battery-free it can feel incredibly light in your hand. It may take some time to adjust but once you learn how to work on the tablet it’ll become like second nature. And the drawing surface can even read the pen’s distance while moving to function like a mouse. Wacom’s pens are generally considered 3x-4x more accurate than other manufacturers because they put effort into the pens, their tablet’s surface sensitivity, and the driver software. And the Intuos Pro works well as a travel tablet if you’re OK to work near a wall outlet. Overall the experience, design, and ease of use for this tablet more than make it the best pick for beginners. Bottom Line: If you can afford the Intuos Pro it’s the best way to go. A beginner can get real mileage out of this tablet for many years with a quality design, a battery-free pen, and a track record of great experiences from Wacom products. If you’re looking to go completely wireless then consider the Huion Giano WH1409. It comes with a built-in 8GB microSD card for storing your work locally or transporting work between computers. 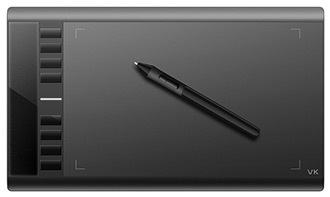 The design looks similar to the Intuos Pro except this tablet is larger, a bit heavier, and comes with more express keys. The display on this thing is gorgeous. Slick but not too slick so you can really catch some texture while drawing. If you’ve never used a tablet before then you probably won’t care about the surface. But the Giano is great for anyone’s preferences because there’s so much space in the drawing area(over 13″ wide). The Huion battery pen that comes with this tablet requires charging so it does feel heavier than the Wacom. Depending on your stance this can either be good or bad. I personally don’t mind battery styluses so long as they’re somewhat light and can hold a charge. And this one can go for quite a few weeks(or possibly even months) of daily use without dying. Perhaps the biggest selling point here is the wireless functionality. The Giano comes with a wireless USB receiver which can be plugged into your computer to paint wirelessly. It comes with a built-in battery so this tablet can run for a few hours before needing to charge. With the built-in microSD card you can even save data to the tablet like it’s a USB thumb drive. This way you can bring your digital artwork to any computer and pick up right where you left off. Along the left side you’ll find twelve individual hot keys which is more than any other tablet here. I can’t imagine any beginner needing that many shortcuts, but it certainly doesn’t hurt! The biggest selling point with the Giano is the wireless feature and the extra 8GB storage. As an actual tablet it’s certainly nice. But I think the response rate is a bit better on the Intuos. 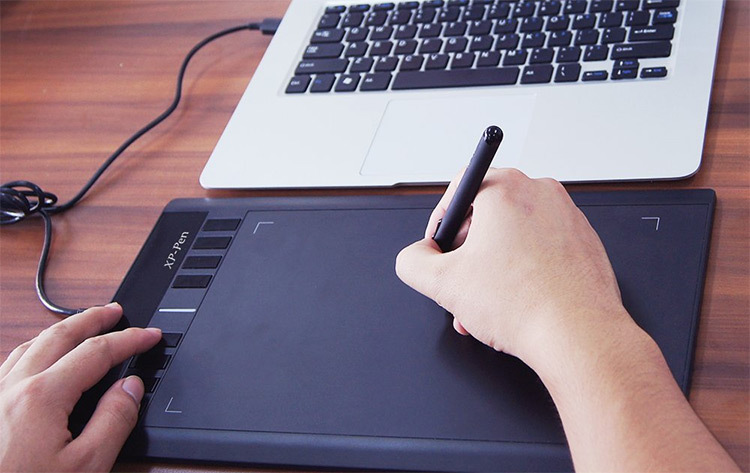 Bottom Line: Huion’s Giano is the largest portable table for beginners. It can go fully wireless for hours and it can store your work on a built-in MicroSD card. But if you plan to work mostly from home then these features won’t make this tablet any better than a Wacom. Small, cheap, and easy to setup. This best describes the Turcom 8″x5″ Pro tablet which is a nice starting point for complete beginners. It is a very low-end tablet but it operates well. There should be no lag while drawing or any jumps/spacing issues with the pen. This is usually the calling card of a bad tablet but the Turcom 8×5 doesn’t have any of it. Since this is a small tablet it’s also pretty light. It can work well as a portable drawing tablet although it doesn’t have any sort of carrying case for the stylus. You’ll notice the tablet actually measures much larger than 8″(actually over a foot). The Turcom’s 8×5 measurement describes the active drawing area on the tablet. This certainly isn’t huge but it’s not too small either. Perfect for a beginner. The stylus pen is easy to use and well designed. It comes with two buttons on the side that can work like mouse clicks, or let you switch between pen & eraser mode. One thing I don’t like is the need for AAA batteries in the stylus. This definitely gives the tablet a cheap feeling when you need to use replaceable batteries for drawing. But it does work fine and the output quality is fantastic. Calibration should be a breeze and the Turcom unit ships with installation software. Once installed you can change the calibration settings to make sure your marks are read accurately. My final point: lower-end Turcoms are cheap for a reason. If you’ll be drawing/painting every day then do not expect this tablet to last for more than a couple years. It really is good and does its job well. But it’s more like a disposable camera that you use when you’re green, then eventually upgrade to a better model as you gain experience. Bottom Line: Great tablet for the price and it’ll deliver a fantastic experience for beginners. But this is cheap for a reason so don’t expect to keep this thing in working order for more than 2-3 years. A cheap yet durable tablet that can last you quite a while is XP-Pen Star03. 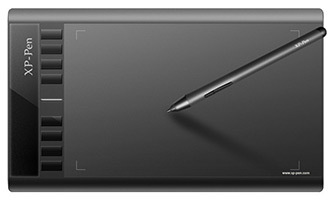 This is one of their signature designs modeled after Wacom’s Intuos with eight express keys and a plain black drawing area. Star03 is one of the more affordable tablets that doesn’t come with any noticeable downsides. It really is fantastic and it delivers exactly what you expect. Bottom Line: The Star03 tablet is a wonderful choice for newer artists on a tight budget. The battery-free pen is light and easy to learn, and the 8 hot keys can help you nail down a professional tablet workflow. Every tablet from Huion comes with great specs and lots of extra goodies. And the Huion H610 Pro is one hell of a tablet for beginners who want a full digital drawing starter pack. Along with the tablet and the stylus pen you also get a free anti-fouling artist glove and a carrying bag to store your tablet when not in use. This keeps it free of dust, dirt, and potential scratches. While the tablet measures over a foot long the drawing surface is a bit smaller. Yet the overall drawing surface still feels large measuring 10″ wide by 6.25″ tall. While moving the pen across the surface you’ll feel a small textured effect like course paper. Many artists prefer the textured canvas over a smooth and slick feeling. The texture keeps your pen fixed to the surface so you’re not sliding around quickly or uncontrollably. But the texture isn’t so thick that you’ll feel restricted. The custom Huion pen does come with a battery so it will need to be charged. But one charge should last up to a few weeks even with daily use. And it has two side buttons that can be programmed to switch between draw/erase mode, or to perform other actions when in design software like Photoshop. The H610 can be fully powered by a single USB cable which also transmits the marks you make back to the computer. It works like an all-in-one cable so you can take this anywhere and keep the cables light. However you still might need to bring the pen’s charger just in case. Huion was even gracious enough to include a free artist glove with this tablet. While drawing you can wear the glove to prevent smears, sweat, grease, or anything else from leaving residue on the drawing surface. It makes cleanup a breeze and reduces long term wear & tear. Bottom Line: Awesome tablet for the money with a quality drawing surface. It comes with 8 express keys, a free artist glove, and a carrying tote for storage. Certainly a viable option for any beginner. If you wanna do professional-quality digital art on a display tablet then the Parblo Coast10 is the best tablet to start with. You can read our exhaustive review on this tablet to see it’s one of the best options for portability, display quality, and simplicity for beginners. The Coast10 measures about 1 foot wide with a default display resolution of 1280×800. It uses a battery-free pen and gets power through a single USB cable making it a nice choice for drawing at home or on the go. What always surprised me the most about the Coast10 is the display. It’s fairly small(only 8.5 inches wide) but it has such luminance and accuracy of all colors. The LCD display truly makes this the best display tablet for beginners. But other features also make this a great buy for anyone who’s never used a tablet before. The Coast10 is super light and small enough to carry in a laptop bag. It’s powered by one USB cord and uses a battery-free stylus pen. The pen is also a well designed piece of equipment being thin, light, and taking the place of a mouse on your tablet. When you tap onto the drawing surface it works as a left-click, and there’s a button on the stylus to mimic the right click of your mouse. So just one USB cable is enough to dive in and start drawing/painting. The display works with a 16:10 resolution which can look weird if it doesn’t match your monitor. But this is the same default you’ll find in MacBooks so this tablet is great for Apple fans(of course it supports Windows too). One thing I don’t like is how hot the tablet can run when it’s been in use for a while. If you go all day it can start to feel a bit hot under your hand by the evening. Over time running at these temps can wear down the internals, so you might have to take breaks throughout the day. I’ve never had any problems with overheating or any issues with stylus taps not being registered. If you can get the drivers installed & calibrate the display you should quickly fall in love with this tablet. Oh and Parblo includes two awesome freebies: a four-port USB hub along with their signature artist glove. The USB hub is “meh” but the glove will reduce stains & smudges on your beautiful LCD display. Bottom Line: This is one of Parblo’s best display tablets. The price makes it a reasonable choice for beginners. The colorful LCD along with the extra goodies means you’re investing in a great product along with your artistic skills. 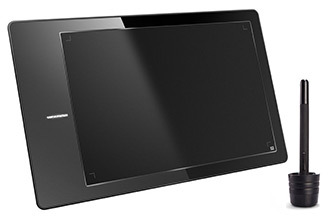 Another trustworthy display tablet is the Artisul D10 designed very much like the Coast10. Except the Artisul tablet is a tad smaller, much lighter, and supports HDMI input for video. This does come with a battery-free pen specialized for Artisul tablets. It also includes 10 replacement nibs and a storage container for the stylus. I’d say this is right up there for best display tablet for beginners just based on the size, display quality, and features. Looking just at design I do think the Parblo Coast10 is a nicer looking tablet. But the Artisul functions just as well using a bright LCD with an anti-glare glass design. The HD resolution also defaults to 1280×800 and the battery free pen feels very similar to the Coast10 design. One big difference is the orientation of the hot keys. For the Artisul D10 all hot keys are aligned towards the opposite side of where the cables stick out. Thankfully you can rotate this tablet to either side so it works for lefties and righties. The tablet is fully powered via USB so you don’t need to rely on a wall outlet for power. But you do need an HDMI port or an adapter to convert HDMI to whatever you need(VGA or DVI). This can be annoying since other tablets can work with just one cable. But most display tablets require extra inputs so this is just par for the course. The stylus feels great and comes with buttons on the side to mimic mouse activity. Unfortunately it does not have an eraser at the top, a staple of other tablet brands like Wacom. But for all the minor faults the D10 is still an incredible display tablet. The price is reasonable and the hardware is great quality. If you get a D10 you can expect it to last for quite a few years. Bottom Line: Very nice display tablet made by Artisul, a popular rising brand known for great products. The tablet’s screen is bright and easy to work on with little texture. The extra wires can get annoying but they’re not a deal breaker. Great choice for beginners who want an affordable display tablet. One of the best non-display tablets for beginners has to be the Ugee G3. The price alone is phenomenal but the design is sleek and the tablet is quick to read every movement you make. If you want all the sordid details you should read our G3 review covering the setup, components, and the pros/cons of using this tablet as a beginner. It may not be packed with features but it does a damn good job of just letting you draw. Measuring almost 1.5 feet this tablet is big. And the drawing area(9×6) is also surprisingly large. Inside the box you get a G3 tablet, a Ugee P50S stylus and the install discs. I’m not a huge fan of the battery in the stylus because there are many battery-free alternatives. However this particular stylus works very well and for the price it’s difficult to complain. Just be sure to keep AAA batteries handy. Also the stylus comes with two side buttons to replicate the left/right clicks on a mouse. This can basically take the place of your regular mouse when drawing on the go. Carrying the G3 as a mobile tablet can be troublesome due to its size. Even though the drawing space is fairly small the tablet is pretty wide. Yes it can fit in a carrying bag. But it might not fit snug on a tiny desk with a laptop. On the other hand it does operate through a single USB cord. So if you have the space then this drawing tablet can be a steal. It does not come with any express keys but if you’ve never used a tablet before then you won’t miss them. What really pushes the G3 for beginners is the quality drawing surface. It can recognize pen taps everywhere on the pad, even towards the edges where sensitivity is known to drop. I don’t know how long this tablet would last with daily use but it feels strong enough to kick around for 5+ years even with normal wear. Bottom Line: The G3 is an incredible budget tablet for beginners who want to start with the basics. The stylus does have a battery which is a pain, and the tablet is fairly large measuring about 1.5 feet wide. But if you can look past those things you’ll be pleased with the G3’s design and ease of use. 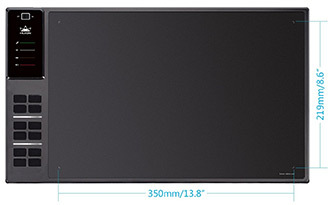 If you like the G3 and want a tablet with a larger drawing area & some hotkeys then the Ugee M708 is sure to delight. The active area measures 10″ wide by 6″ tall so it’s reasonably sized for a beginner. And it’s powered by one USB cable which makes setup a whole lot easier. Oh and did I mention hot keys? Cause this has eight of ‘em. Somehow Ugee managed to make the M708 smaller than the G3, yet it has a larger drawing surface. They’re both within a similar range so budget should not be an issue. 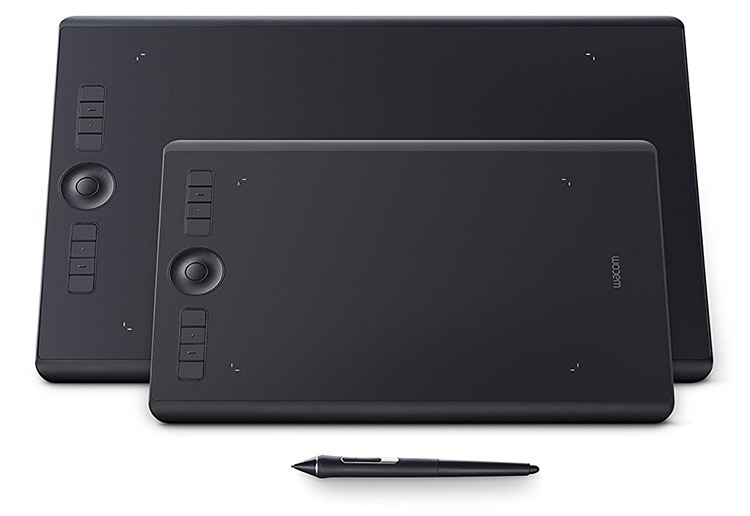 This tablet uses the same battery-powered stylus as the G3 so they’re both comparable models. You don’t get much with one over the other beyond hot keys and a larger drawing space. One common issue reported with the M708 isn’t with the tablet, but with the driver. If you’re using Windows 10 this tablet may not be worth the hassle. Ugee hasn’t released a fix(to my knowledge) and it doesn’t seem to affect everyone, but W10 users can have trouble keeping the driver running without crashing. Calibration works fine on all systems and you shouldn’t have trouble with pressure sensitivity or jittery marks. Even the surface area feels very smooth much like a Wacom Intuos Pro. I like the surface style and it’s great for beginners who need to adjust to the world of drawing tablets. Overall the M708 is very much like the G3. Same manufacturer, similar specs, except this one is built a tad smaller and includes express keys. Up to you if either one is worth grabbing. 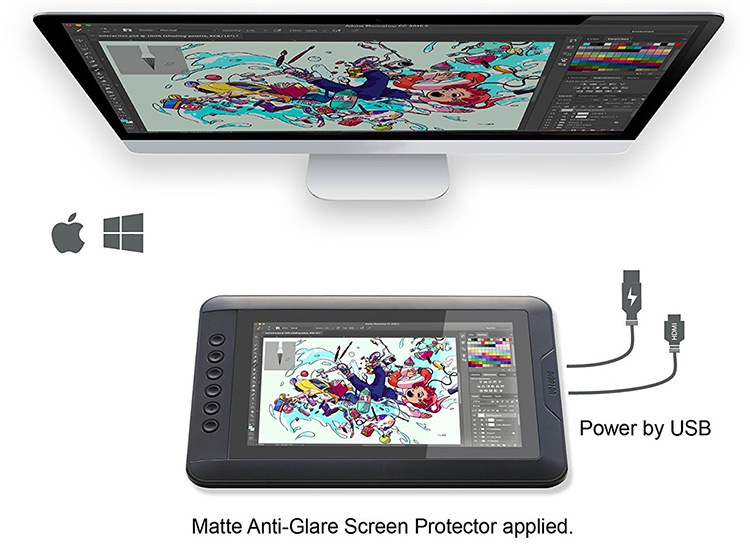 Bottom Line: Ugee’s M708 replicates the Intuos drawing surface with the G3’s design style. You get hot keys which are great, but the battery-fixed stylus can be annoying to change. Still a nice tablet for the price. If you’re confident in your art practice then why not splurge on a high-end tablet? The Wacom Cintiq 13HD is the best display tablet for beginners with a simple design, a built-in stand, and a very simple setup process. All the specs are incredible with a 1080p display, four express keys, and a battery-free Wacom pen designed to last for years of consistent use. 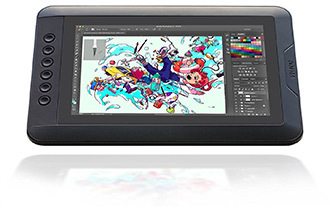 Wacom’s displays are phenomenal and they’re able to charge premium rates because their hardware is the best in the business. The Cintiq 13HD screen feels much like the size of A4 printer paper. Every part of the drawing surface is sensitive to pen touch so you can draw anywhere, even the corners, with accuracy. And Wacom’s drivers support all major OS’ including Windows XP-Win10 and up through all recent versions of Mac OS X. As a beginner you probably want to start cheap. But if you’re willing to splurge then the Cintiq HD13 can easily last a decade or more with a quality drawing experience and unrivaled accuracy. Bottom Line: The Cintiq 13HD is not cheap but it’s worth every penny. It’s perfect for artists who will put in the hours to improve and want their first tablet to be something that’ll last. Price is usually a factor when shopping for new art equipment. 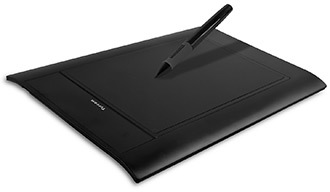 If you want the best graphics tablet for the money then the XP-Pen Star03 is your best option. It is by far one of the cheapest non-display tablets but it comes with a lot of great features. You get a battery-free stylus pen that includes two programmable buttons to act like a mouse. Plus the tablet itself has eight express keys. The actual working area is also surprisingly large measuring 10″ wide by 6″ tall. This is a bit smaller than the size of printer paper. But it should be more than enough space for a beginner to dive into the world of digital art. All the XP-Pen drivers for Windows & Mac are fairly easy to install so you can get this working on any system. Not to mention the drawing input can handle any software like Photoshop, Painter, Krita, Gimp, or whatever else you wanna use. XP-Pen’s tablets have been phenomenal in my experience. Their craftsmanship and attention to detail is surprising, and that’s why the Star03 is such a great deal. You can also look into other Star models like the Star04 which we previously reviewed. But I specifically recommend the Star03 because of its size, style, and price which all even out to the best deal for a new artist. Some artists may want to jump right into the world of display tablets. Generally beginners should start with a smaller model, but even the smallest displays ask for a good chunk of change. The best display tablet for a beginner is the Artisul D10 combining a number of factors like design, build, price, and portability. Since the D10 relies solely on USB it can work anywhere from the coffee shop to your living room couch. Artisul only uses battery-free pens so you’ll get a lightweight stylus with eight replacement nibs. And the drawing experience is phenomenal with a bright screen and six express key buttons. I do think the screen is a tad small for a display. But it’s perfect for a beginner who just needs to learn the ropes and get familiar with digital tablets. If you’re OK with the higher price tag check out the Artisul D13 which has a larger screen than the D10 but includes many of the same features. However when first moving digital there’s a lot to learn. The workflow can be tiresome and frustrating when you first start, even for experienced artists. This is why a smaller screen like on the D10 can work better. One downside is that neither Artisul model comes with a stand. But this is also a good thing for beginners who just need to learn how to draw flat on a tablet. Either way Artisul is a trusted brand with two incredible display models. I recommend the D10 for beginners who really prefer to start with a display, but you can’t go wrong with either choice. You have so many tablets out there to pick from but don’t let this slow down your decision. It’s good to make a list of features that you want, including a budget, to help nail down your best options. This list covers all the best models you can get that work well for beginners. You should find plenty of great options here that can work within your budget and still deliver a great drawing experience. And if you’re still not sure what to get you can take another look over this guide. I’ve tried to make this post easy to skim and clear enough for any new artist venturing into the world of digital tablets.